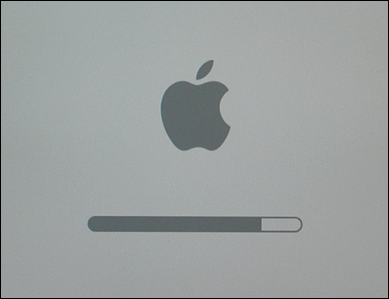 If you see a screen with a progress bar (something like the shot above), your Mac is starting up in Safe Mode. This shouldn’t happen unless the user intentionally wants to do so for troubleshooting purposes. However, if you find that your Mac is defaulting to Safe Mode when you try to start up normally, try the following tips. Check that the Shift key is not accidentally being pressed down or stuck. If you suspect the keyboard may be faulty, plug in a different keyboard. press ‘return’ on your keyboard. Enter an Admin password (type carefully as it will not be echoed to the screen) and restart the Mac. 3. Do a PRAM reset. In this case, a PRAM reset effectively does the same as No.2 above. However, if No.2 didn’t work, it’s worth trying this way of doing it in case for some reason the boot memory failed to hold the preference setting. You can also do this step instead of Step 2 if you are not comfortable with using the Terminal. 1. Power down the machine. 3. Press the ‘power on’ button. 4. Immediately – and before the grey screen appears – hold down ‘command-option-P-R’ all together. 5. Keep them held down until you’ve heard the start-up chime twice. After you release them you should hear it again, and hopefully your Mac will boot up as it should normally.